While not a new development, quantum computing is the next target for intrepid developers, most of whom are physicists and scientists rather than programmers and inventors. The hardware needed to run a quantum algorithm is finicky at best and is downright terrifying to maintain. But what is quantum computing and what goes into making a quantum computer? A conventional modern PC is capable of two binary states, these being a one or a zero. These bits make up all of the information that your stock home computer hold on its hard drive. However, a quantum computer is somewhat different. Rather than being able to operate in states of one or zero, it is able to be in both states at once or in superposition as well as every state in between. Rather than binary bits, these machines use qubits. A quantum computer makes use of principles of quantum mechanics, notably quantum interference in the most widespread design models, rather than conventional physics in order to operate. Just to illustrate the difference in processing between your home PC and something quantum, a 30-qubit system will run at the real world equivalent of a conventional unit running at 10 teraflops. Since home users have got access to processing in the gigaflop range at the moment, this is a huge jump in power. Maybe Crysis will finally run on Ultra. It would appear that quantum computers are in fact a reality. They are very difficult to maintain, construct and understand. Unless you are one of the geniuses involved in the project, that is. Mostly theoretical at this point, there have been major advances in the field of quantum computing. In March 2000, scientists at the Los Alamos National Laboratory announced that they had constructed a 7-qubit quantum computer inside a drop a liquid. The liquid in question was either alanine (used to analyze quantum state decay) or the tongue busting trichloroethylene (used for quantum error correction) and the state of the qubits in question is read by nuclear magnetic resonance or NMR, which is a method of indirectly measuring the state of a qubit. The problem with measuring a qubit directly is that an accurate reading will drop a qubit out of superposition (should it be in that state) and turn your quantum computer into a conventional one. The methods used in quantum computing in order to create results are far too lengthy to fully explain almost everywhere outside their scientific literature and the systems being created also vary, making a broad assessment impossible. Very much in their infancy, there are strides forward being made. 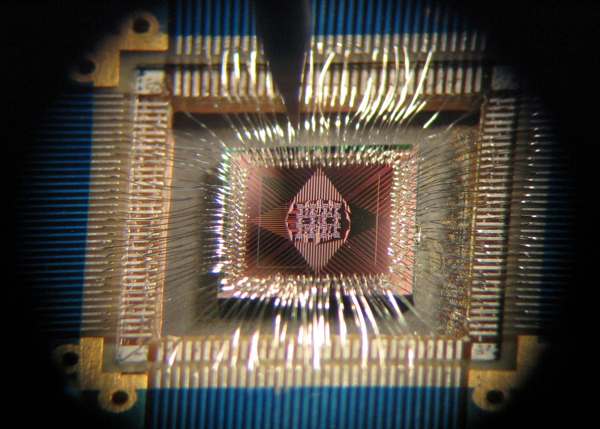 From 2000 and Los Alamos's 7-qubit machine there have been; another 7-qubit machine demonstrated by IBM and Stanford University; the development of the first qubit using ion traps in 2005 and most recently a 16-qubit quantum computer that was demonstrated by D-Wave Systems in late 2007. Rather than just being a theoretical construct, this computer was able to solve Sudoku puzzles and other problems that were demonstrated. D-Wave Systems in particular are raring to get a working model of a quantum computer on the market as soon as possible. Their planned system will not be a fully functional one but will rather be what one quantum algorithm designer calls 'special purpose noisy piece of hardware' that could take up the task of running physical simulations that are impossible on conventional silicon technology. Looking forward to the future of computing quantum computing has the potential to far outstrip anything that a home user could have imagined. Such processing power could even be put to use creating a true life simulation, a form of virtual reality indistinguishable from reality itself. Labels: Quantum Computer, Quantum Computing Basics, What is a Quantum Computer?